Allu Arjun is one of the leading stars of Telugu cinema and has a humongous fan base. When he shares any update or pictures on his social media handle, fans go gaga over it. Yesterday (March 21), across India people came together and enjoyed Holi. Be it the celebs or commoners, all join hands for this festive spirit keeping aside all other works. And it was the same for superstar Allu Arjun. It was a fam-jam for the Telugu superstar! Allu Arjun was seen having a gala time with his wife Sneha Reddy and children on the occasion of Holi 2019. Allu Arjun Shares a Beautiful Picture With Wife Sneha Reddy on Their 8th Wedding Anniversary! 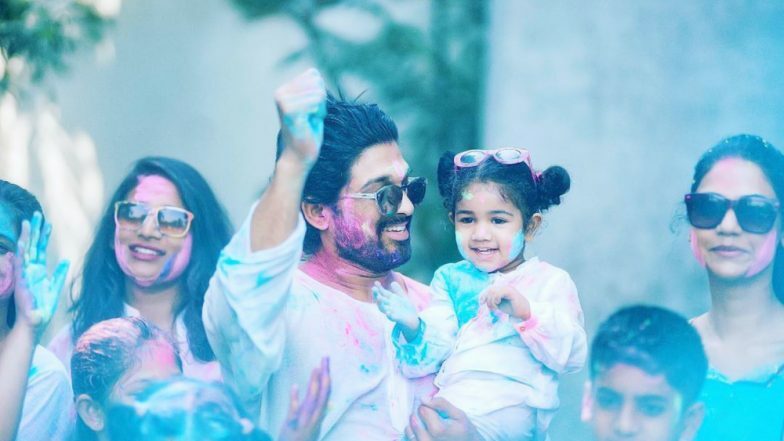 Allu Arjun aka Bunny has shared some beautiful, colourful pictures of Holi 2019 where he is seen enjoying with his family. It is clear that this fabulous four (Bunny, Sneha Reddy, children Arha and Ayaan) have had a great time and these pictures are proof. Also Bunny’s pictures with Arha and Ayaan are just too cute to handle, don’t you agree with us? Gully Boy Actor Siddhant Chaturvedi Is a Die-Hard Fan of Tollywood Star Allu Arjun! On the work front, Allu Arjun is reuniting with Sukumar for the third time. The super-hit combo is coming back together after a gap of nine years, after Arya 2. There were even reports stating that Bunny would be collaborating with director A.R. Murugadoss, however that may not happen in the near future.